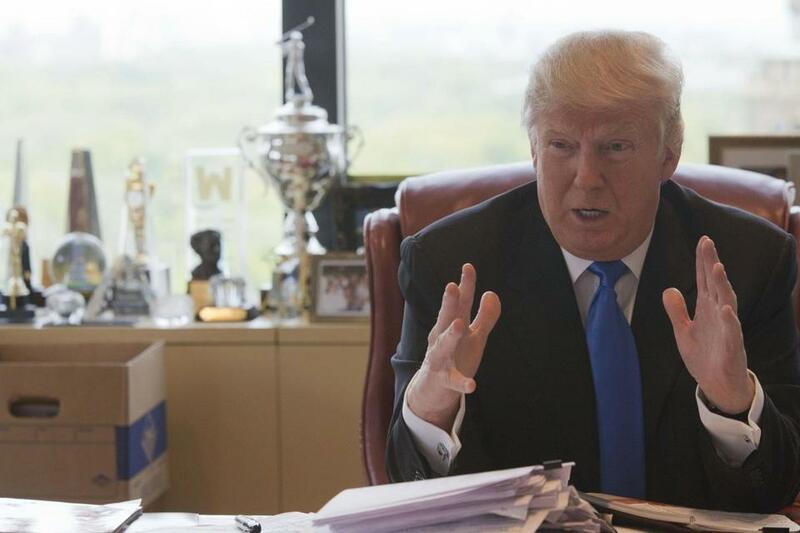 Donald Trump spoke in his office in Trump Tower in New York on Tuesday. NEW YORK — As he tries to charm Republicans still skeptical of his presidential candidacy, Donald Trump has a challenge: On several key issues, he sounds an awful lot like a Democrat. Trump says his views on trade are ‘‘not really different’’ from the rest of his party’s, yet he pledges to rip up existing deals negotiated by ‘‘stupid leaders’’ who failed to put American workers first. He regularly slams the North American Free Trade Agreement involving the U.S, Mexico and Canada, and opposes a pending Asia-Pacific pact, positions shared by Democratic candidate Bernie Sanders. Trump long has maintained that he has no plans to scale back Social Security benefits or raise its qualifying retirement age. The position puts him in line with Clinton. She has said she would ‘‘defend and expand’’ Social Security, has ruled out a higher retirement age and opposes reductions in cost-of-living adjustments or other benefits. ‘‘There is tremendous waste, fraud and abuse, but I’m leaving it the way it is,’’ Trump recently told Fox Business Network. ‘‘Remember the wheelchair being pushed over the cliff when you had Ryan chosen as your vice president?’’ Trump told South Carolina voters this year, referring to then-vice presidential candidate Ryan’s budget plan. ‘‘That was the end of that campaign.’’ Ryan was Mitt Romney’s running mate in 2012. ‘‘I am open to doing something with it,’’ he told CNN this month. ‘‘On foreign policy, Hillary is trigger happy,’’ Trump said at a recent rally, He listed the countries where the U.S. had intervened militarily during her tenure as secretary of state and pointed to her vote to authorize the Iraq war while she was in the Senate. ‘‘This doesn’t fit any of the boxes,’’ Phares said. Clinton has advocated using ‘‘smart power,’’ a combination of diplomatic, legal, economic, political and cultural tools to expand American influence. She believes the U.S. has a unique ability to rally the world to defeat international threats.